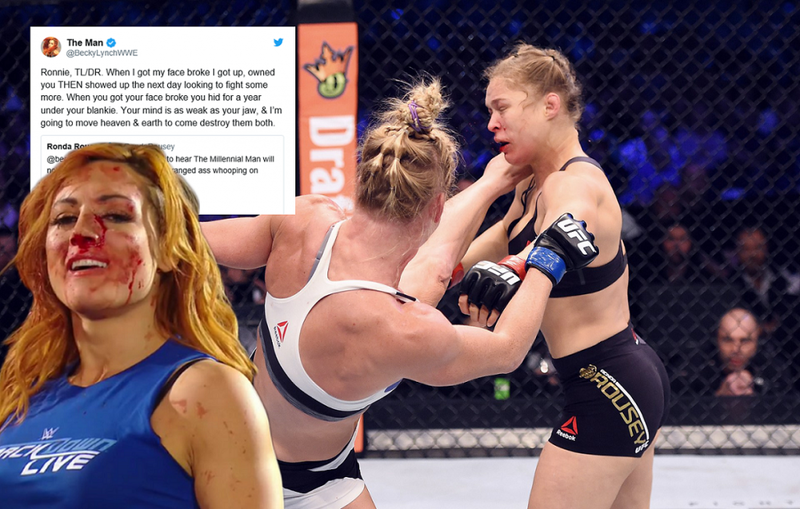 Becky Lynch on Ronda Rousey's loss to Holly Holm: "You hid for a year under your blankie"
It has been a couple of years since former UFC women’s bantamweight champion and Hall of famer turned WWE superstar and current WWE Raw women’s champion, Ronda Rousey’s MMA career came to a halt. Even though Rousey attained major success in such a short time as a member of the WWE roster, she still cannot deny or escape probably the most heart wrenching defeat of her MMA/UFC career, a devastating knockout loss in 2015 at the hands of Holly Holm that ended her historic UFC women’s bantamweight championship reign. Rousey was scheduled to square off with current WWE Smackdown women’s champion Becky Lynch this coming Sunday at the WWE’s annual November extravaganza, Survivor Series. Unfortunately, due to Lynch suffering a broken nose and a concussion from an accidental stiff jab from fellow WWE superstar Nia Jax on this past Monday’s Raw, Lynch was forced out of the match and will instead be replaced by Charlotte Flair. Despite Rousey and Lynch not getting the chance to do battle against each other inside the squared circle Sunday, that has not stopped their war of words as the two have been throwing verbal jabs at one another on social media. After Rousey had recently criticized Lynch for bowing out of their Survivor Series match, Lynch responded with a ruthless insult, as she dissed the Raw women’s champion for how she dealt with her 2015 loss against Holly Holm. Do you think Ronda Rousey will ever get over her 2015 KO loss to Holly Holm?